Get to know countries and their people, explore beautiful landscapes and buildings... the fascination about traveling. For that purpose the bicycle is a great way to get around. With it you are totally independent, you can go for great distances and also preserve the nature. This homepage was built after my first bike tour through Tibet. 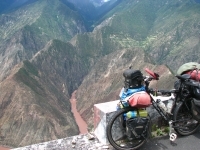 I cycled in summer 2005 from Lhasa to Kathmandu. This trip was so amazing and inspired me to my second, bigger bicycle trip through Asia. I started that one in Juli 2007 in Russia, cycled from Irkutsk through Mongolia, China, Vietnam, Cambodia, Laos, Tibet and Xinjiang. Enjoy this Homepage!